Finished Size: 7.5" x 10.25"
Originally designed as an entry to an anime art contest, this piece expands the word play in the title of one of my favorite manga series, "Hana yori Dango". The title swaps the characters for "boys" with the characters for "dumplings" or "food", so that the traditional saying, "food before flowers", becomes "boys before flowers". Since such traditional sayings in Japan and China are often the subjects of watercolor screens alongside pictures of nature, I figured that I'd keep the motif, only using the pun version. 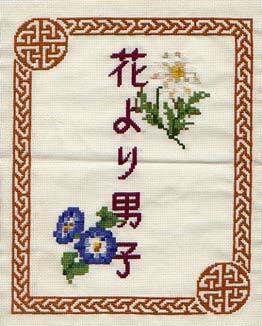 The two flowers are a pansy (lower left) and a daisy (upper right), chosen to represent the two main characters, the pampered rich boy Doumyouji Tsukasa and the sturdy working class girl Makino Tsukushi, respectively. An earlier version included the full names of the characters in English text, but I decided that the names would overwhelm and clutter the design. In a couple of places, the floral motifs overlap the central Japanese text motif, which sort of connects and ties the three pieces together to make it seem like one flows into the other. I tried to be careful not to obscure the characters though, since I still wanted the text to be legible. The border is a combination of two Celtic knotwork motifs: a round, closed knot with 4-way rotational symmetry for the corners, and a knotted braid for the sides. Adjusting the braid pattern to merge at each of the square corners was a tricky business, and involved much pencil-and-eraser work. The backing is Aida cloth, which holds together well without binding or blocking, and the neutral color was essential to support the muted colors of the daisy. The size and small details of this piece incline me to frame it, though I may need to back it with a fabric border because of the rather too small canvas borders.